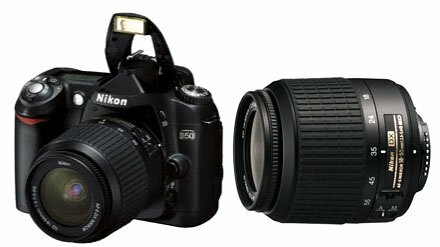 Pictured above is my camera - it's a Nikon D50 Digital SLR. It's 6.1 megapixels, and takes SD cards and SDHC cards up to 8gb in capacity. It comes with a rechargeable battery and charger, the cable to connect it to my PC (via USB 2.0), a neck strap, and caps for the lenses so they don't get dust on them. Because it is an SLR camera, you can change the lenses for different purposes, and you can add extra flash units onto it, too. The lens that it came with is an 15-55mm lens. A special promotion lets you get an extra lens, a 55-200mm, via redemption coupon for free. It has a lot of advanced features, as one would expect from such a high quality camera, but at the same time it's very easy for someone that's used to the 'point-and-click' consumer based digital camera to get the hang of. The main difference is that instead of automatic zoom, you twist the end of the lens to zoom yourself, and the camera auto-focuses for you. The other significant difference is that you do not preview the image on the screen at the back, instead you look through the zoom finder. After you take the photo, you can review it on the screen and delete it if you so wish. When you connect it to the computer, the computer sees it as being an external hard drive, like an oversized floppy drive, or like a flash ('thumb') drive. This is a very neat feature, as no extra software is needed. On the top of the camera is a dial, that sets different photo modes. You can select "Automatic", "Portrait", "Landscape", "Children", "Close Up (Macro)", "Night Portrait" or "Manual". The latter is for advanced photographers that know exactly what they're doing. The modes are very cleverly thought out and very easy to use. All in all, this a wonderful camera for both novices and advanced photographers - I am very pleased with this camera! It retails in Australia for about AU$1300, which includes one lens. If you shop around, you might be able to get a better price. This information was current as of November 2005.